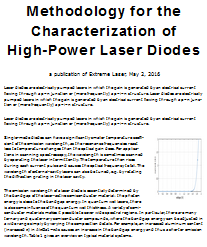 The Photonics Spotlight - Lower Emission Cross-section Leads to Higher Pulse Energy?!? Abstract: It is explained why a passively Q-switched laser tends to emit more energetic pulses if its laser crystal has a low emission cross-section. This sounds counterintuitive but can be understood. You may have heard it: if you take a passively Q-switched solid-state laser, the emitted pulse energy per unit area in the laser crystal is approximately inversely proportional to its emission cross-section. So you get more energy out if you choose a material with lower emission cross-sections. Doesn't this look weird? After all, lower emission cross-sections mean a weaker interaction of the excited laser-active ions with the optical field, so one should expect a weaker rather than a stronger output. Next, we can see that the gain efficiency, which can be defined as the gain (e.g. in dB) per millijoule of energy stored in the gain medium, is obviously proportional to the emission cross-section, and thus inversely proportional to the saturation fluence. A low emission cross-section means that you need to pump more energy into the crystal to get a certain gain. Further, a passively Q-switched laser always starts to emit a pulse once the round-trip gain exceeds the losses. Therefore, a crystal with low emission cross-sections will have to be pumped longer before a pulse is generated. But once this happens, the pulse will be more intense. How much energy can be extracted by it, does normally not depend that much on the emission cross-section, but mainly on the amount of saturable absorption and the output coupler transmission, apart from the beam area in the crystal. Ultimately it gets clear: the crystal with low emission cross-sections gives us more intense pulses, but fewer of them, i.e., it has a lower pulse repetition rate. In an actively Q-switched laser, things are different. There, the pulse is emitted when we trigger it. As a result, the pulse energy will not depend much on the emission cross-sections. With low emission cross-sections, you may get a longer pulse due to a lower laser gain – unless the gain efficiency is preserved or even increased by a longer upper-state lifetime. We are not just talking about some curious phenomena. Understanding such things is essential for efficiently developing good laser designs. You can then quickly find out what beam area in the laser crystal will be required for a certain pulse energy. (To some extend, you can also adjust the parameters of the saturable absorber, but often only in a limited range.) Also, one can then calculate the resonator length required for a certain pulse duration. If you don't know these things, you are prone to start out with a too high or too low beam area, or even with the wrong crystal material, and you will have to change a lot of things after first experiments. That results in an inefficient and thus often too costly laser design and/or in non-ideal designs. Many people in the laser industry are wasting a lot of resources by working out such product designs with insufficient understanding. In simple cases, one can do it without numerical simulations. A set of not too complicated equations often allows me to develop a design rather systematically and quickly. But these equations are based on a number of assumptions, which are not always well fulfilled. For example, you might have gain guiding effects in a high-gain laser, and it hard to tell without simulations how strong these are. Particularly if high performance including high pulse energy and high beam quality is essential, one wants to check more reliably how the design should behave – in order to change it before the first experiments if it isn't working well.